Available only at Megalodon, ReCoPaks are an Eco-friendly package made with recycled content...perfect to convey a natural, earth-friendly feel to your title. 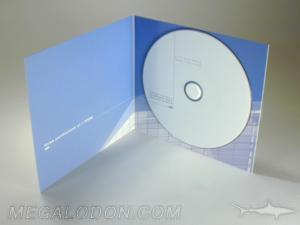 -Recycled content available with any cardboard stock packaging; minijackets, wallets, Custom Digipak Packaging, etc. -70-80% Recycled Content can be printed 4C. -Fiberboard version printed from 1C to 4C with select artwork (not suitable for fine, detailed printing) gives a very natural pigment dyed look. See our special page on spot white ink on fiberboard packaging, setup and examples. -Foam hub, tray, or pocket for disc.